Leverkusen’s comeback season took a hit, as Pál Dárdai and Hertha became the second Bundesliga team (behind Bayern, duh) to beat Bayer 04 twice in the league. How though were BSC able to take three points from the BayArena? That’s exactly what happened, with BSC finishing with a 8.92 PPDA for the match, as individual errors by the hitherto excellent Jonathan Tah and some great finishing by Salomon Kalou and Valentino Lazaro were enough to take three points for Hertha. For Leverkusen Panagiotis Retsos was a surprise starter at LB, spelling Wendell, while Benny Henrichs who had lost his RB spot to the versatile Lars Bender filled in at RB. The CB pairing of Sven Bender and Jonathan Tah started and that would turn out to be a problem, as they had both played 300 minutes between January 28th and February 6th – a matter of 8 days! Although both CBs have been outstanding so far, Tah had already looked tired in the cup match against Werder, conceding a clumsy 3rd minute penalty to Max Kruse, while the injury prone Sven Bender has logged 1655 Bundesliga minutes – the most since 2010\11. (Tah had also played every minute of the three previous cup games since August, while Bender played 2.5 games in the DFB Pokal) As the guys on the Neverkusen Podcast suggested, at some point Heiko Herrlich should have given one\both of them a rest, with the recovered Tin Jedvaj, Retsos or even twin brother Lars Bender (who is incidentally out with an abductor injury that typically happens after overuse). The Kohr-Baumgartlinger double pivot meant that Charles Aranguiz, arguably Leverkusen’s best central midfielder this season would get the day off. The attacking three was made up of Julian Brandt on the left, Karim Bellarabi (in a spot start, perhaps rewarding him for his game-winning cup goal, perhaps to spell others) and Kevin Volland behind Lucas Alario up front. Kai Havertz and Leon Bailey were both presumably rested after playing 120 minutes in cup, with the Jamaican. 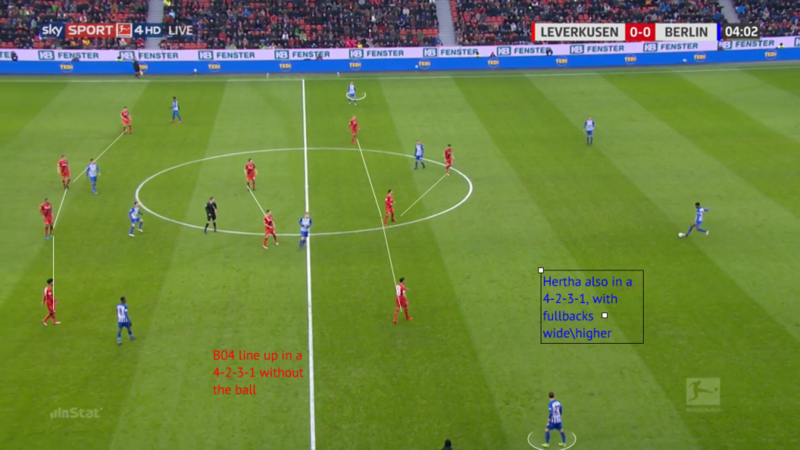 The 4-2-3-1 by Herrlich would be defensively compact and force Hertha’s buildup to go wide. Hertha’s 4-2-3-1 lineup was less surprising: Mitchell Weiser had lost his starting spot after a couple key errors in the 1-1 draw against Dortmund to the reliable Peter Pekarik, while the left back spot has long belonged to Marvin Plattenhardt. The young CB pairing of Niklas Stark and Jordan Torunarigha provides excellent athleticism and Dárdai has increasingly started to pick Torunarigha over the veteran Lustenberger. Just a few weeks back, the young CB was the hero of the Werder match with a 93rd minute clearance with his body to save a point for Hertha. The Hungarian coach is of course eminently familiar with Hertha’s youth setup (all three of his kids 18,16 and 13 play for Hertha’s youth teams) having spent 3 years as a youth coach after his retirement coaching the likes of Torunarigha and co.
Lustenberger was moved up to be one half of the double pivot, the other half being Hertha’s biggest talent, 19-year-old Arne Maier, a deep-lying playmaker among the world’s 60 best young prospects as per the Guardian. Davie Selke has been spearheading the attack, while Salomon Kalou and Valentino Lazaro have nailed down the two outside spots. The #10 spot has been perhaps the biggest weakness for Hertha this season, as Ondrej Duda’s not produced much after his 4 million Euro move in the summer of 2016. The major knee injury that he came with from Legia in Poland didn’t help matters for the talented Slovakian playmaker, but in his first healthy season this year, he’s been a frustrating player capable of brilliant skills and even executing a tactical scheme against a tough opponent like Dortmund (man-marking Julian Weigl), but has failed to create much with one goal, on a tap-in vs Bayern, a measly 0.99 total XG and 2 key passes in 543 minutes. His recent injury opened the way for Vladimir Darida, who was Hertha’s player of the season two years ago, as they marched into Europe. The Czech central midfielder was really effective in that aforementioned 15\16 season in that attacking midfielder/#10 role, scoring 4 of his 5 goals from there. Unfortunately, he has already missed 14 games this year due to ligament and a knee issue and this was only his second start after the Hoffenheim match. Given that Darida was leading the Bundesliga in distance covered in the last couple years, his inclusion in an advanced position should’ve signaled that Hertha were going to pressure Leverkusen. Going with a high-pressing approach carries with itself some innate risks, but also some enormous rewards. Employing it against a team like Leverkusen that features an excellent combination of speed and passing is a dangerous plan: Kohfeldt’s Werder tried it in the DFB Pokal, and given that B04 were 0-2 down after 7 minutes, one could say that it definitely worked. However, it’s definitely a double-edged sword, as the goal by Julian Brandt in that same match showed: a couple slips and over commitment by your CBs and Kohr ran through Werder to make it 1-2. Hertha had to be careful not to fall into that trap, or suffer the fate of Hoffenheim: death by transition goals in a 4-1 Leverkusen victory. 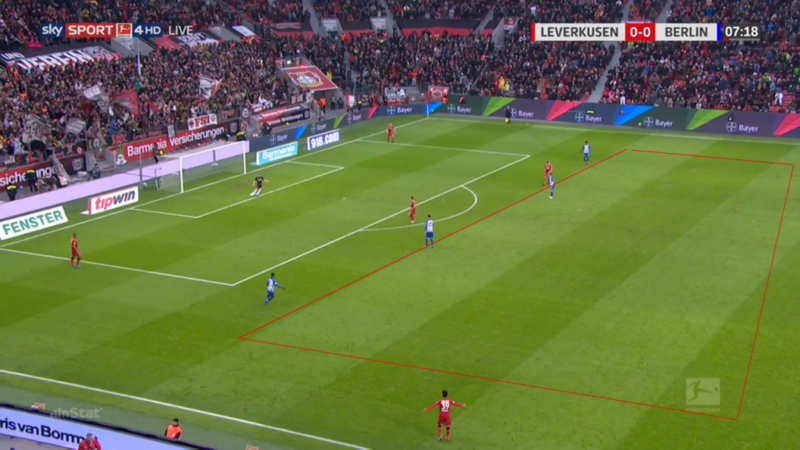 Hertha’s initial high-pressing approach caused problems for Leverkusen: you can see how Bender’s body positioning (and Lazaro’s orientation) prevents him from seeing the left side of the pitch (see the triangle). The man-marking on their double pivot (circled) leads to a long-ball up the pitch and\or a back pass to Leno who has to hit it long. Leverkusen were neither set up nor were content to play long-balls up front, as Bellarabi, or Brandt are not exactly strong in the air, while Volland and Alario had very little chance against the towering Torunarigha\Stark duo who won 10 of 13 headed duels for the match. Alario did win 5 of 11 in the air, but struggled elsewhere, winning just 8 of his 28 overall duels. Their best aerial threat, Kai Havertz, was of course on bench after playing 120 minutes in the cup on Tuesday. Short passes are a key part of Herrlich’s philosophy, as B04 have the third shortest length of passes on average in the Bundesliga with 18.3m. On Saturday that number was down to 16.7 meters, the lowest figure of the matchday. Leverkusen also lead Matchday 22 with 182 short pass attempts and 150 completions (vs their season average of 110\134), while also topping the speed of accurate passes category with 17.4km\h on average, against their season average of 15. The tactical adjustment was to drop back with one of the double pivots to create problems for Hertha: As Baumgartlinger, who is a very solid playmaker out of the back, now presented BSC with some tough questions. With Selke marking Tah, Lazaro marking LB Retsos and Darida moving up to shadow Bender, Kalou hesitantly moved inward and his gesture suggested that he wasn’t thrilled with the idea of going up to press Baumgartlinger, for he now would have to leave Kohr, who has the speed and athleticism to run a transition attack like we saw against Werder. Lustenberger who is usually a CB and sometimes a defensive midfielder was probably not used to being this high and caught in a bind: Should he stick to Kohr and abandon the dropping Julian Brandt to his right? At any rate, he was stuck in no-man’s land, and so was Kalou who failed to get there on Baumgartlinger. The Austrian threw in a nice passfake that made Lustenberger commit towards Kohr, and the passway to Brandt was open. Lustenberger tried to correct his mistake and pressure Brandt, leaving Kohr open. Brand’ts quick pass and Kohr’s excellent turn presented Bayer with multiple passing options and Hertha with all kinds of problems. The pass upfield to Volland was a good one, but Niklas Stark’s crucial intervention stopped what would’ve been Julian Brandt going in on goal. This example shows the risk\reward of high-pressing: a few positional errors and lapses\miscommunication could lead to a team being carved open through the middle with a couple of quick and accurate passes. 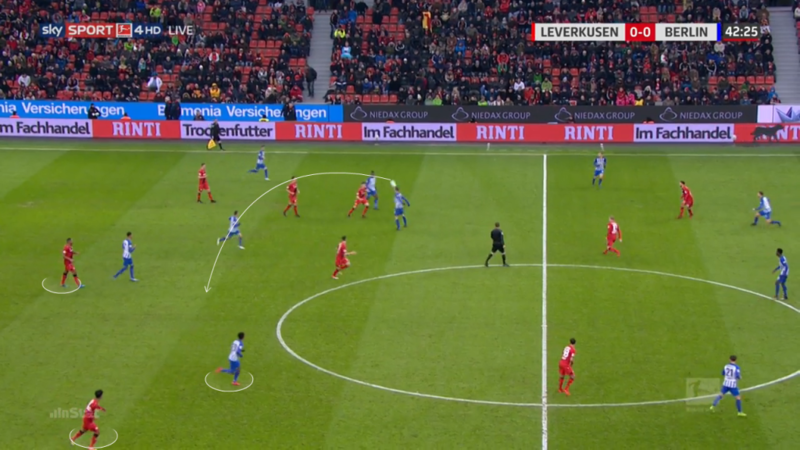 This sort of disconnect between the four pressing players and the rest of Hertha is probably down to not enough practice, but it’s also an example of Leverkusen’s other alternative to beat the press: Leno tried to find the fullbacks wide – you can see Henrichs asking for the ball in space here at the bottom of the image. Counterpressing also was a key component of Hertha’s plan and their average distance to Leverkusen’s goal during ball recovery was 37m nearly 3 yards higher than their season average of 40.1 meters. They managed 13 ball recoveries in the opponent half, nearly 1.5 times the amount of their season average of nine! Despite all of those Hertha efforts, Leverkusen were in control of the match with a 4 to 1 shots edge and 69% possession and if Karim Bellarabi had taken a first touch that wasn’t 15 yards too long on a breakaway. Retsos’ header from a corner in the 9th minute also forced a good save from Jarstein, while Jordan Torunarigha’s key interception on Volland and the aforementioned Stark tackle also rescued Hertha who wouldn’t get their first shot on target until Vladimir Darida’s long-range effort in the 37th minute. With the left side of Leverkusen missing both Wendell and Leon Bailey, Julian Brandt often dropping deep into the half space to playmaker, putting Valentino Lazaro, Hertha’s speediest winger on the right was perhaps not the best use of his talents. In addition, Salomon Kalou had struggled with his pressing duties as well as containing the adventurous Benjamin Henrichs who attempted 45 passes in the first 45 minutes, while also showing up in spaces where fullbacks do not often do. Karim Bellarabi was also beginning to cause problems with his runs behind Plattenhardt, but also by dropping deep into the right half space and allowing Henrichs to push forward. K All of that meant that the decision to switch Kalou and Lazaro in the 38th minute could provide a solution.In addition, Henrichs’ increased offensive involvement came at the expense of Leverkusen’s defense, leaving space in behind for Lazaro to run into. A deflected pass at midfield suddenly gave Hertha a 3v2 situation in the middle, with Lazaro making a run behind an unsuspecting Henrichs. Tah’s decision to step-up and ruin the offside trap was ill-advised and mistimed: he got nowhere near the ball to make a play on it and Darida’s pass was perfect for Lazaro to sprint unto and finish for 0-1. The second half continued in similar fashion, with Hertha starting out in a high-press out of the gates. However, due to being up a goal, Hertha now were also able to play their counterattacking style as well.Leverkusen were dominating with 68% possession, but mustered just one shot in the first 12 minutes. Torunarigha’s unfortunate injury was the only notable moment (Skjelbred took Lustenberger’s spot in midfield, and the Swiss went back to CB) until the 57th minute when Tah committed an even bigger error. It looked a routine long-ball by Pekarik and Tah had all kinds of time to figure out what he wanted to do with it. at that point, Leverkusen threw on Kai Havertz, pushing Bellarabi back to RWB. The 69th minute provided one of the crazier examples of an inside the box free kick, awarded after the rarely-called “goalkeeper picks the ball up twice” move by Rune Jarstein. The pinball sequence somehow resulted in no goal, despite the efforts of Bailey cleared off line, Volland hitting the bar and a goal mouth scramble afterwards. It did give Leverkusen a boost on their match XG total from 0.4 to 1.2, but it probably also speaks volume that Bayer were only able to create 0.4 XG up until that point. Pohjanpalo’s header and a Lazaro shot that hit the bar were the last two notable events of the game, and Hertha came away with a well-deserved three points. In the grand scheme of the most competitive Bundesliga race for Europe, Leverkusen suffered quite a setback, as Leipzig, Dortmund and Eintracht all won and passed them. Trips to HSV and a home match against Schalke should still leave them in excellent position to fight for one of the three remaining UCL spots (Bayern obviously have one wrapped up). With their competitors having to play each other (Eintracht vs Leipzig, Schalke-Hoffenheim, Dortmund and Gladbach next week) Herrlich’s Bayer are still in a good position. Hertha have finally won a game in the spring portion of the season, though draws against Dortmund, Bremen and Hoffenheim are not bad results.With 4 of their next 6 against the dregs of the league (Mainz, HSV, Freiburg, Wolfsburg) they could afford to not get points against Bayern and the recently struggling Schalke and still make their way up the table. It’s also possible that Dárdai and Hertha,despite being 11th, are talking themselves into a run to make Europe, which given that 7th placed Augsburg have 31 points is certainly well within reach.